Wow, I can’t get enough of the new song and video by Alexander Jean and Lindsey Stirling called “Stampede”. Powerful stuff!! Check it out below, dance along, and be sure to download the single HERE! OUTSTANDING!! As you know, Mark Ballas and BC Jean aka ‘Alexander Jean’ released a new video called “We Three Kings” starring Casey Abrams. Here they are behind the scenes. Fascinating stuff! I love Mark Ballas and BC Jean! Below they talk to The Jam about their new “We Three Kings” single which hit #1 on iTunes (yay). They also talk on their song writing skills and even play a Newlywed Game. Thanks to Andrea for the heads up on this interview. And an we play this jewel again? OH yeah…. Mark Ballas and BC Jean aka ‘Alexander Jean’ released a new video called “We Three Kings” starring Casey Abrams. I absolutely have no words for how awesome this is. Let us know what you think in comments and don’t forget to RT and post this everywhere you can. It’s so deserving. Powerful powerful stuff…and so creative!!! ETA: Check it out! It’s hit #1 on the Singer/Songwriter chart. Also below is the single’s art work. Stunning…. Singer/Songwriter chart for a bit today. Below are two great teasers for the finals of Dancing With The Stars Season 25…..a new promo. Also, Julianne tells us on her surprise (thanks Lori for the heads up). Also, from Disney ABC, you can read some more details on the performances and how voting will take place. This is going to be great. For more dancing info, see the new Who’s Dancing What…and When? post. In the two-hour season finale on TUESDAY, NOV. 21 (9:00-11:00 p.m. EST), it will be a Christmas spectacular as the three finalists advance to the final stage of the competition. There will be live dancing and show-stopping performances at both The Grove and in the “Dancing with the Stars” ballroom. The couples will each perform two dances. The first will be a repeat performance of their favorite dance from earlier in the season. And in the last element of competition, the couples will perform a new routine as part of a “24-Hour Fusion Challenge,” in which they will each fuse two contrasting dance styles, and they’ll have less than 24 hours to prepare. For the first time ever, following the completion of both dances by the three remaining Dance Couples, the public will be allowed to participate in an online-only live vote via ABC.com at http://dwtsvote.abc.go.com/ and Facebook at http://bit.ly/2o1VO7b. The vote limit will be five votes per voting method, and the voting window will be open for approximately five minutes. The live voting window will only be available during the live broadcast in the Eastern and Central time zones, and voters must be physically located in the U.S. or Puerto Rico to vote on ABC.com. Voters in Canada will be able to vote during this same voting window on Facebook only. The judges’ points and viewer votes from November 20 will be combined along with the night’s judges’ points and online-only viewer votes from the repeat dances and “24-Hour Fusion Challenge” to determine the winner. At the end of the night at The Grove, a champion will be named, and the winner will be presented with the coveted Mirrorball trophy. 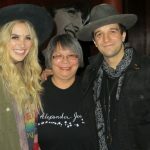 Mark Ballas and BC Jean aka Alexander Jean released a new video today for “Paper Planes” from their latest EP, ‘High Enough’! You can watch it below. It’s beautiful! Want more? If so, be sure to stream or download their ‘High Enough’ EP now at Alexander Jean. It’s a winner in more ways than one! You might know Lily from comments and other Pure blogs. 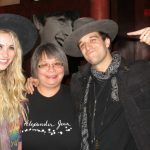 Well, Lily saw BC Jean and Mark Ballas, aka Alexander Jean, perform in New York City, NY at The Cutting Room. Below she tells us all about it. Lily also sent us some fun photos and beautiful videos of their performances. You will love this. Enjoy! (((((THANKS LILY!!!!))))) You are a jewel! I’ve been a fan of Mark Ballas on DWTS because of his creativity, choreography, goofiness and of course his dance skills. I had a meet and greet with DWTS live tour in January 2015, but Mark wasn’t there that day so I was disappointed that I didn’t get to meet him. During week 9 of DWTS S21, when Derek Hough and Bindi Irwin used Alexander Jean’s song Roses and Violets, I was inspired to see them in concert when they announced their tour last year. When Alexander Jean played Webster Hall in NYC in July 2016, I was able to meet Mark and BC before and after their show! Since then, I have been able to see Mark perform as Frankie Valli in Jersey Boys in October 2016, and November 2016. If I Were a Boy – Beyonce song written by BC Jean et al. The songs on their first EP are inspiring, and were performed with talent, passion & chemistry. The show ended around 12:15 am. Many of the Jersey Boys cast were there to show support. There were also friends of Val Chmerkovskiy who were there to support Mark and BC such as Nicole Volynets. We all waited around for Mark and BC to greet the fans. Marianne and I got on line to wait to talk with Mark and BC Jean. When it was my turn, I said hello and introduced myself, and they both said it was nice to see you again, and always show your support. I said something like “you remembered”? Mark said “It’s hard to forget you. Thank you for always showing your support”! Awwwww! I was holding a photobook that I made, and Mark asked “what do you have there”? 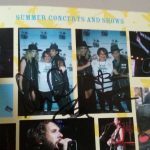 I said I made a photobook and showed him the page of our meet and greet from July, and asked them both to sign the page. They were happy to oblige, and then we proceeded to pose for our pictures. Marianne was taking pictures during our talking & signing, so when it was time for the posed picture, the camera wasn’t ready, so we had to wait a few seconds. She was able to take a couple of pictures. Mark also asked me to tag him when I post the pictures. After saying thank you, and that I will miss them, they promised that they will come back in the summer for their second EP release. Afterwards, I asked Mark if he will be doing DWTS, and he made a hand gesture about being not sure! We shall see! We left the venue around 1:50 am. Marianne dropped me off at 2:30am, and she didn’t get home until 3:50 am so it was a late night for sure, but we had a great time! Thank you Mark and BC! Here are some pictures and videos. I tweeted some pictures and videos, and Shirley Ballas liked them. Enjoy!